Durable and trendy, the DHP Basic Metal Twin Bed is the perfect fit for any kid or guest room with limited space. Both headboard and footboard feature clean lines that will compliment any room décor. 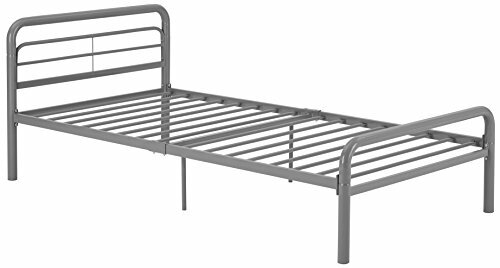 Complete with metal slats and supporting legs, this bed eliminates the need of a box spring or bunkie board. Available in two colors – black or silver – the DHP Metal Twin bed is a great addition to any room!